Along with human-centered design and lean startup, co-creation is an approach arising to prominence in the development lexicon over the past five years. Some of us (myself included) have used “co-creation” without understanding what it means, simply assuming it was an event that brings together a variety of partners to brainstorm ideas to solve a problem. 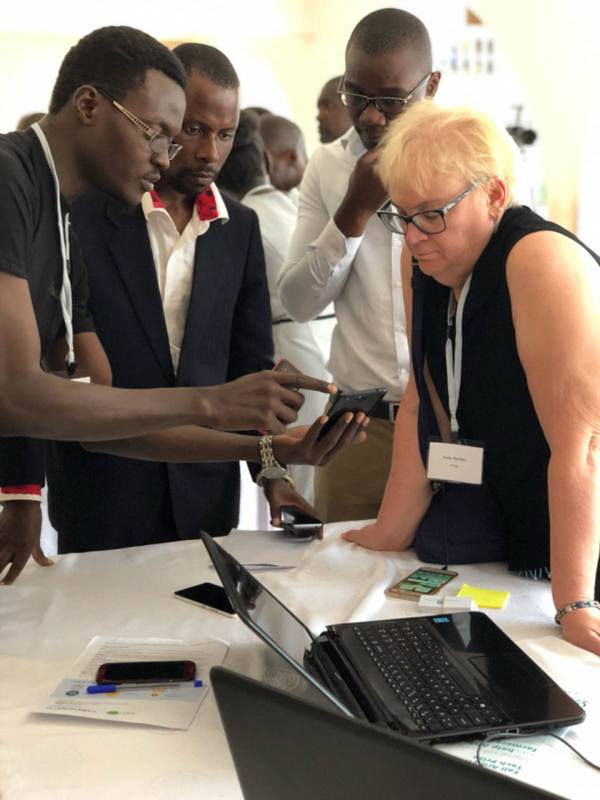 Only when I attended the Fall Armyworm Tech Prize co-creation workshop from June 26 to 29 in Kampala, Uganda, did I grasp the nuances of co-creation and realize the significant benefits it holds for the end users of co-created products. Fall armyworm is a devastating pest that can destroy potentially millions of tons of crop yield across Africa, drastically reducing the incomes of smallholder farmers and those who rely on crops for their livelihoods. In response to the 2016 fall armyworm outbreak, Feed the Future and partners Land O’Lakes International Development and the Foundation for Food and Agriculture Research (FFAR), created the Fall Armyworm Tech Prize competition. This open event has attracted developers of digital tools and approaches from across Africa and beyond, each vying to provide the best solution for procuring timely, targeted information that smallholder farmers can use to identify, remedy, and track incidence of fall armyworm. Twenty finalists—out of 228 applicants—were selected to attend the workshop, participate in feedback sessions about their prototypes, and further develop these for the next phase of the competition. The workshop also convened partners from the private sector and government; experts and mentors in agriculture, technology, and business development; and, most importantly, future users of these new tools and approaches—the farmers. My rudimentary understanding of co-creation within the prize process wrongfully pushed me to assume that although co-creation encourages collaboration, at its core this prize is a competition, and with five prizes totaling $400,000 on the line, the idea of “co”-creating could only be taken so far. I was very wrong. Co-creation creates an environment that unites competitors. Our three-and-a-half days were filled with sessions that unpacked the problem of fall armyworm, incorporated human-centered design in prototype development, developed business plans (including fundraising, costing models, and communications), considered ways to measure impact, and hosted practice sales pitches. These sessions helped the finalists understand how to improve their ideas, but what happened behind the scenes was where the spirit of co-creation really took flight. It seemed that competition was replaced by a strong focus on collaboration to solve an endemic problem. This might be at a coffee break where someone recommended a data analytics tool to integrate into a potential solution, or at a lunch where two finalist groups decided to join forces—the heartbeat of co-creation emerged when I least expected it. Several finalists proposed digital tools that use machine learning to help farmers and extension workers identify the pest. Early on, they realized that their tools lacked the ample imagery needed to reliably recognize fall armyworm. In response, those innovators brainstormed over dinner how to create an image bank to train their classification models. These finalists might not win the top prize, but this co-creative effort could ultimately result in a tool that decreases or prevents damage to farm yields. On Day 2, finalists pitched their ideas to partners, potential investors, and farmers at an exhibition-like marketplace. Many finalists used this opportunity to have farmers test their digital tools and provide feedback on how to make them more user friendly and helpful given farmers’ technological constraints. Continual interaction with farmers during the workshop allowed participants to appreciate farmers’ needs as they built and iterated their tools. Finally, on the last day, one of the finalists collected the phone numbers of the others and created a WhatsApp group for all to bounce ideas off one another and share approaches during the remainder of the prize process, which concludes in mid-November when our five winners will be announced. Together these examples embody the key to a successful co-creation: Give people the space and time to go beyond a structured program and work together in their own way to achieve a common goal. As we move toward the next phase of the prize process, I look forward to seeing how the solutions are fueled by this collaboration and farmer engagement. Before he died at age 95, agricultural development pioneer Dr. Norman Borlaug made a request to developers of technology: “Take it to the farmer.” FFAR Executive Director Dr. Sally Rockey (pictured up top) cited this quote in her closing remarks. This sentiment was taken to heart by the Fall Armyworm Tech Prize finalists, who looked past the prize money to focus on co-creating solutions alongside some of the very farmers who need their help.